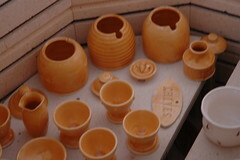 apologies for this blurry photo, but the kiln is really too hot to even vent yet. This is this week's load- full of egg vases and bowls, honey pots, egg cups, and a sprinkling of ladybug ware. It has been raining cats and dogs in memphis. Really, it's been so wet that I had to resort to drying pottery in the oven because it didn't want to dry otherwise. I have two ponds in the back yard that refuse to drain, and I don't know about you, but I'm ready too see more blue in the skies than I did for half an hour on Tuesday. I'm at the market again this weekend, then next weekend I'm heading down to New Orleans for a girls' weekend and to see one of my best college buddies graduate with her phD in public health from Tulane. I'm taking the train down and am excited about the extended knitting, daydreaming, podcast-listening time. I haven't taken a train since I rode from Rocky Mount, NC to Washington, DC in the spring of 1993. One last thing. Have you heard about this? I doubt I'll get to one hundred, but I went from maxing out at 5 to 12 in my first week. Though the first week took two to complete. I'm surprising myself with my abilities. Have a great almost-weekend. Hope you see some blue skies where you are.